This entry was posted in All Blogs, Going Green, Marin County, Marketing and tagged Building, Development, ECO, FFIC, Firemans' Fund, green, LEED Certified, Luxury Hotel, Marin, Novato, Outreach, Platinum, World Class Hotel by Sylvia Barry. Bookmark the permalink. I am new to area, and looking Novato as possible investment area. My apology – FFIC means Fireman’s Fund Insurance Company, one of the largest local employers in Marin county. I used to work for FFIC, managing IT projects, hence the reference to my FFIC friends – a few asked for information about the project. Another concern is the security of the site, especially the parking structures. The residential ones will be secured parking and public ones will have patrol – American Assets will be researching this. My thought – Also try to imagine how the site will look at night and when the leaves fall. It’s pretty dark now when you drive by, but it could be more lively at night with hotel, residential structures and community center. Thanks for this update. This is certainly an exciting possibility. Seems to have something for everyone. I wonder how much underground parking it takes to support a campus of 5000 people. The developers also might want to look at integration with the (proposed) SMART train station in the immediate area. Thanks, Walter, for the comment. Madeline Kellner, Novato City Council Member as well as SMIA member, said that she passed this blog to Novato City Clerk to forwrad to other city council members. 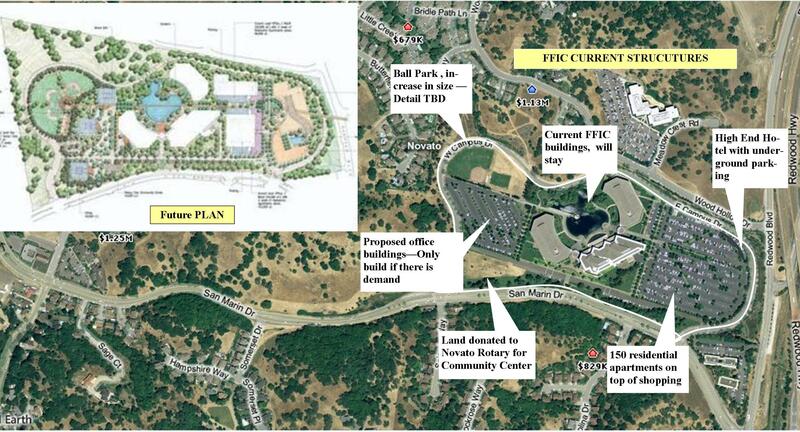 Hope we get more comments/input like yours for the developer and Novato city council members to consider.